The purpose of the panel discussion was to provide a platform for development of a community of people committed to equitable and effective cooperation among researchers and academics, technicians, fisheries officers and non-governmental organizations in research and practice on gender in aquaculture and fisheries and explore the ways to promote gender equitable and sustainable livelihood opportunities in GFP value chains. This panel discussion had been arranged alongside the Conference by the Gender in Aquaculture and Fisheries Section of the Asian Fisheries Society. It was its first activity since the group had been formally launched earlier in 2017 after more than 20 years of activities alongside various meetings and symposia. Dr. Malasri Khumsri of the DoF, Thailand, chaired the session which was mentored Dr. Meryl Williams. Two panelists were Dr. Harvey Demaine, a former faculty of the Aquaculture and Aquatic Resources Management Program at AIT and Dr. Amonrat Sermwatanakul (Dr Noi), expert on ornamental fish and the Gender Focus Point of the Thai DoF. Dr. Demaine, in introducing his paper on “Women in the GFP Value Chain in Bangladesh”, paid tribute to the role of the late Dr. M.C. Nandeesha in promoting the focus on gender in aquaculture, his paper was based on successful Danida-funded projects in Noakhli, Bangladesh. After briefly describing the important contribution of prawn aquaculture to Bangladesh and its rural economy and stressing the difference between the two culture systems of brackish water shrimp culture and freshwater prawn culture, he noted that there had been several studies by development agencies on the GFP value chain which focused on gender. These studies mainly identified the involvement of women in post-larvae (PL) catching, a marginal livelihood strategy often associated with natural disasters, and in low-wage and seasonal work in processing plants. Dr. Demaine noted that the potential for GFP in the area covered by the Danida projects had long been recognized. 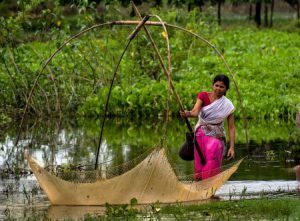 This had been taken up by the Greater Noakhali Aquaculture Extension Project (NAESP) in 2003, which had adopted a strongly pro-poor approach to its development. This meant examining the potentials for poor households, especially women-headed households, to involve in the value chain. Processing and sale, which mainly involved women again in their role in financial management, as well as in the local marketing of value-added products. The way forward to improve gender mainstreaming in GFP aquaculture in Thailand should be to consider the gender dimension as an integral part of the development strategy for the sector; that there should be more gender-disaggregated analysis of GFP value systems; that the authorities should assist in capacity building and facilitation of women’s groups in these systems; and that networking between groups and publication of their activities through various media channels should be encouraged. The panel was asked whether the findings of the two studies were any surprise. Their view was that, while the involvement in low-cost marginal occupations was well-known, the range of opportunities for women was much wider but the value chain had to be explored in detail to identify these and promote them. In other papers given at the Conference, Fatima Ferdouse Razeghpanah of InfoFish mentioned that current trends in the international market indicated a relative stagnation in the consumption of prawn in Western Europe and a rapid growth in domestic consumption in countries in Asia with a growing urban middle class. In support of the observation of Dr. Noi above, she argued that this offered considerable opportunity for women entrepreneurs/traders to market value-added products from prawn, such as the prawn samosas now appearing in Bangladesh. Timothy Pickering from the South Pacific Community in his paper on the development of giant prawn farming in the Pacific Islands also noted the important involvement of women in the newly developing supply and marketing chains.